One of the smaller pieces in Queen Margrethe's collection is this bandeau tiara, made of diamond and turquoise stones forming a small wreath of daisy-like flowers (all the more perfect considering Margrethe's nickname is Daisy). The tiara is a converted bracelet, and it comes as part of a set that includes earrings and a trio of brooches that can be used in an array of different formations, including as necklace pendants. According to Dronningens Kjoler by Katia Johansen, a book on the Queen's wardrobe written with her cooperation and which mentions this parure briefly, the history of this set is thought to go all the way back to Catherine the Great, a.k.a. Catherine II of Russia (1729-1796). 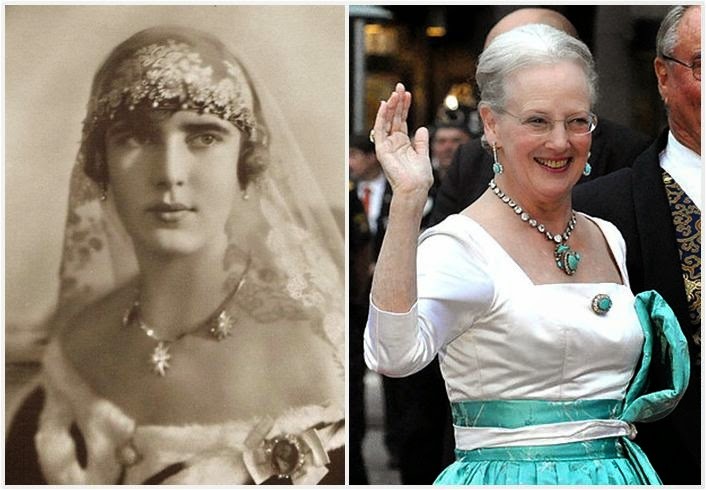 We can definitely trace the turquoise set back to Queen Margrethe's grandmother, Princess Margaret of Connaught (1882-1920), who married Prince Gustaf Adolf of Sweden (the future King Gustaf VI Adolf) in 1905. Margaret - also nicknamed Daisy, by the way - died young and these jewels were inherited by her daughter, Princess Ingrid (1910-2000). Ingrid married the future King Frederik IX of Denmark and brought the set to its current Danish home. Queen Ingrid was only pictured in the tiara as a young girl, and apart from a loan or two (it was worn in 1964 by Margrethe, for example), it largely disappeared from the public eye for several decades. Now owned by Queen Margrethe, it has experienced something of a resurgence in recent years. The bandeau is primarily used for some of Queen Margrethe's more restrained state banquet appearances. Queen Margrethe has also loaned the bandeau out on at least one occasion, something she does not often do. She surprised tiara watchers in 2012 during the celebrations for her 40th year on the throne by loaning the tiara to her niece, Princess Theodora of Greece (see above, or also here). Video: The tiara in action at a state banquet in 2011. Actually quite sparkly for one so small and with so many opaque stones. I've always found this tiara rather youthful; with the combination of the bright color, the small size, and the flower motif, I'd call it cute, even. And I'd love to continue seeing it on different family members, but I'm also happy just to see it in use by the Queen. Not everyone loves turquoise jewels, but with this set and her more modern pieces, she seems to have a true appreciation for the bright blue stone (as do I!). Too cute, or just right?